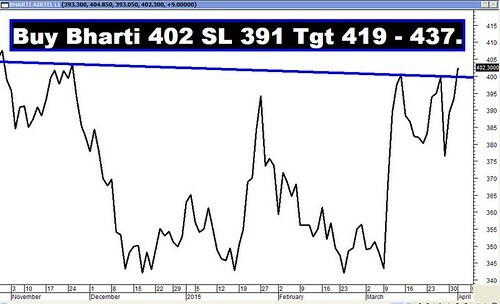 Archives : BULLISH HARAMI ON WEEKLY CHARTS - 01/04/2015. NIFTY 8800 – A KEY LEVEL. Even though it was a truncated week, it was full of dramatic twists and turns, as the Nifty made a stunning recovery from lower levels. Despite such a massive pull-back, the short term and medium term trend continue to remain down. Bulls are awaiting a further rate cut in the forthcoming RBI policy meet, failing which the market will again resume the downward journey. Till the Sensex remains below 29000 and the Nifty below 8800, it will continue to remain a Sell on Rise market. Sensex opened the week at 27655, made a high of 28298, low of 27624 and closed the week at 28260. Thus it closed the week with a gain of 802 points. At the same time the Nifty opened the week at 8390, made a high of 8603, low of 8380 and closed the week at 8586. Thus the Nifty closed the week with a gain of 245 points. On the weekly charts, both the indices have formed a Bullish Harami which is a bullish reversal pattern requiring a confirmation. On the daily charts both the indices have formed a white body candle. Thus daily and weekly charts are showing signs of bullishness. On the monthly charts, both Sensex and Nifty have formed a Bearish Engulfing pattern. This pattern can be negated only if Sensex closes April month above 30024 and Nifty above 9119. This week saw both the indices recover from intermittent lows of Sensex 27248 and Nifty 8269. The immediate pull-back levels are placed at Sensex 28309-28636-28964 and 8593-8694-8794 for the Nifty. 61.8% Retracement level coincides with a minor top which will provide strong Resistance to this current upmove. Thus 28964-28978 for the Sensex and 8788-8794 for the Nifty will act as a Resistance Zone. Both the indices have already completed a Bearish Rising Wedge pattern and the target for which falls at 26049 for the Sensex and 7882 for the Nifty. This pattern will get negated only if we have closing above Sensex 30024 and Nifty 9119. Besides this, the indices completed a bearish breakout for Ascending Broadening pattern and the target for that is at Sensex 25034 and 7533 for the Nifty. The market has bounced back this week but still both the indices continue to remain below the short term average of 20dma (Sensex – 28428 and Nifty – 8628) and medium term average of 50dma (Sensex – 28812 and Nifty – 8722). However the long term average of 200dma (Sensex – 27258 and Nifty – 8185) still holds. Thus the trend in the short term and medium term timeframe still remains bearish whereas the trend in the long term timeframe still continues to remain up. MACD and Price ROC are both negative and continue with their Sell signals. RSI (48) has moved higher but is still below the equilibrium line and hence indicates bearish momentum. Stochastic Oscillator %K (43) remains above %D and hence in Buy mode. MFI (42) has moved higher but still suggests money outflow. ADX at 16 suggests that the trend has little strength. Directional Indicators continue in Sell mode as +DI continues to remain below –DI. Darryl Guppy indicator continues with its Sell signal. Thus majority of Oscillators are still suggesting a bearish bias. Option data suggest highest Put Open Interest buildup is at the strike of 8400 and highest Call build-up is at the strike of 9000. Thus Option data suggests a trading range with support coming in at 8400 and resistance around 9000. Trendline Support for the Sensex is at 27485. Trendline Support for the Nifty is at 8276.